Alright, so you need a suit and fast. Maybe your nephew’s graduation just crept up on you (they grow up so fast! ), or you forgot to mark your high school friend’s wedding on your calendar (poor old, forgettable Bob). It happens. And while we here at Sharp are big proponents of custom-made suits, sometimes the local department store is your safest (and quickest) bet. They’ve got plenty of inventory, usually carry separates (which is great news for you, Mr. I-Have-Enormous-Shoulders-But-Keep-Skipping-Leg-Day), and can get you looking styled and profiled in a jiff without breaking the bank. But! Not all under-$500 ensembles are created equal. If you’re going to go off-the-rack, you’ll want to stick with a retailer that actually makes an effort to offer quality fabrics and contemporary cuts. Our vote: Kenneth Cole’s Reaction line. The collection boasts a healthy array of slim-fit pieces epitomizing the brand’s clean, urban-inspired aesthetic, and they can be mixed and matched to suit your specific body type (seriously, though, start doing some damn squats). The sleek tailoring is combined with utilitarian details like stretch fabric, ensuring enough comfort and movability for you to be able to cut a rug at Bob’s wedding reception with supreme ease. 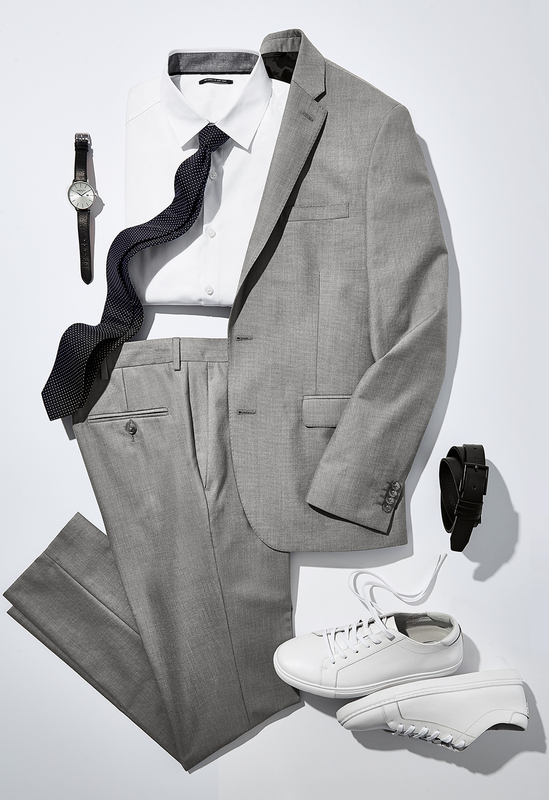 (The line is easy on the wallet too — $170 for the suit jackets, $80 for the pants). What’s more, the material is remarkably lightweight, so you won’t be drenched in Shia LaBeof-in-Transformers levels of sweat three minutes after leaving the house.